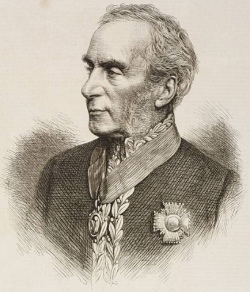 One of the first joint commissioners of the London Metropolitan Police, Sir Richard Mayne was also the youngest ever commissioner, and – with a stint of some 39 years, between 1829 and 1868 – the longest serving commissioner in the service’s history. Mayne was born in Dublin, Ireland, on 27th November, 1796, as the son of Judge Edward Mayne of the Queen’s Bench in Dublin. He studied at Trinity College, graduating in 1818 with an arts degree and then at Trinity College in Cambridge, graduating with a Master of Arts in 1821. He was called to the Bar at Lincoln’s Inn in February, 1822, and commenced practice as a barrister in England’s north where he would spend the next seven years. In 1829, he was selected by Home Secretary Sir Robert Peel – without interview – after applying to serve as one of the two new commissioners of the Metropolitan Police. Just 33-years-old, he was officially known as the “Second Joint Commissioner” with Colonel Charles Rowan his senior colleague. The pair – with his military background, Rowan brought his organisational and leadership skills to the job; Mayne his legal expertise – took up their posts on 7th July, 1829, and from their offices in 4 Whitehall Place (the back entrance was in Scotland Yard) set about creating the new police force. The first constables of the new force were sworn in at the Foundling Hospital on 16th September and commenced their work patrolling the streets of the capital on 29th of that month. Supported by his new income of £800 a year, Mayne married Georgina Marianne Catherine in 1831. The couple’s children would include Richard Charles Mayne who became a Royal Navy vice admiral. In 1850, when Rowan retired, Mayne became the First Commissioner with Captain William Hay appointed the Second Commissioner. In 1851, Mayne took personal charge of policing at the Great Exhibition and, despite Hay’s protests that he should have done that job given his military background, so successful was Mayne’s efforts that he was made a Knight Commander of the Bath (he had been made a Companion of the Bath in 1848 at the same time Rowan had been made a Knight Commander of the Bath – it had been suggested by some at the time that Mayne should have received the same honour as Rowan but it’s worth noting the latter had been a Companion of the Bath for his military services since 1815). When Hay died in 1855, an Act of Parliament was passed changing the force’s structure so that it was to be headed by a single commissioner with two assistant commissioners. Mayne would serve in the role of sole commissioner for the next 13 years. His period as sole commissioner was not a particularly happy one – the force’s handling of the Hyde Park riot of June, 1866, and the force’s mishandling of the Clerkenwell bombing in December, 1867 were two events which led Mayne to offer his resignation (which wasn’t accepted). Mayne died while still in office at his home in Chester Square in Belgravia on Boxing Day, 1868, as the head of a force which had grown to almost 8,000 officers and policed a huge area. Mayne, who was survived by his wife, was buried at Kensal Green Cemetery. A monument to him was unveiled there on 25th January, 1871. Mayne’s legacy – his work in the formation of the Metropolitan Police – can still be felt in the capital today as well as in other police forces, not only in the UK but around the world. PICTURE: Portrait of Richard Mayne in an illustration from an 1869 edition of The Illustrated London News. (Via Wikipedia).